Ooh, I've got some exciting news to share! I've been asked to join the talented group of crafters over at the Where Creativity Meets C9 Challenge! It's a challenge dedicated to the amazing company, Concord & 9th and their amazing products. The challenge this month is to CASE one of the Where Creativity Meets C9 Challenge's designers. There were so many great designs to choose from, but I ultimately went with Lindsey's Happily Ever card that can be found here. 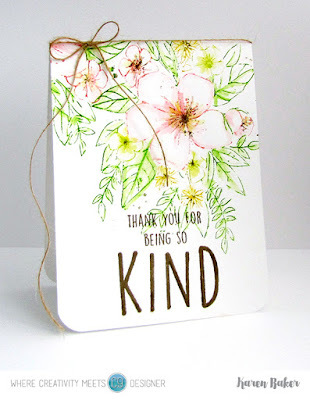 Of course, I loved the overall simplistic beauty of the card, and was drawn to the colored outlines of the flower images arranged at the top, with a bold sentiment towards the bottom. I replicated the same idea in my card. 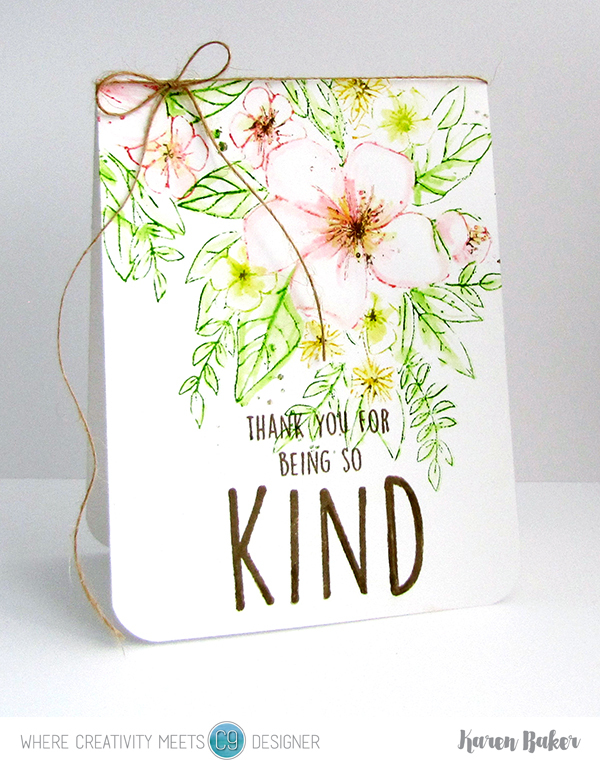 I stamped the floral image from Hello Lovely onto white cardstock, using Zig Markers right on the stamp. I then added a bit of water to pull some color into the image, still leaving the edged look. I finished the card with a stamped sentiment from Kindhearted. I rounded the corners and added a burlap string bow. The challenge is sponsored by the fabulous Concord & 9th and one luck random entry will receive a $25 gift certificate for a Concord & 9th shopping spree. The favorite entry will be asked to guest design for a future challenge! 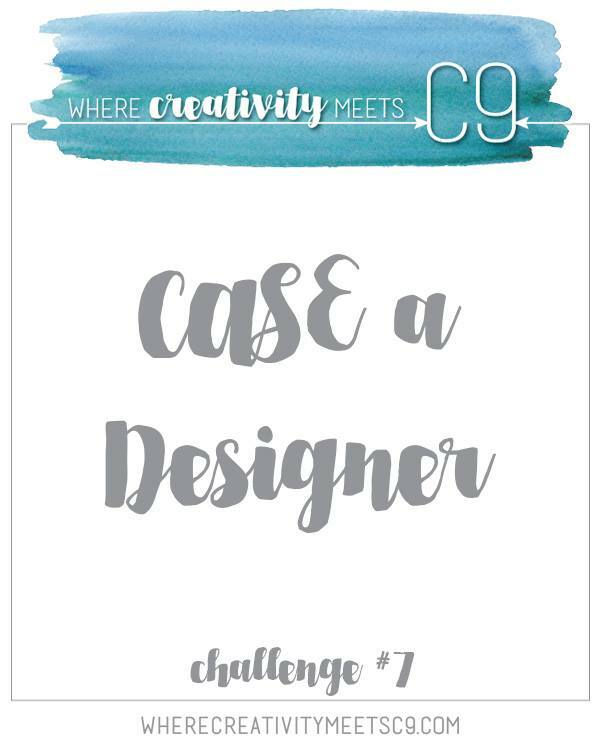 The challenge runs until March 29th, so there is plenty of time to pull out your favorite Concord & 9th stamps and die and create a project CASEing one of the Where Creativity Meets C9 Challenge Designers! Plus, new Concord & 9th products were released TODAY and they are fantastic! Yay, so happy you've joined the team! And what a gorgeous CASE! :) Love it!! Karen this is such a gorgeous card! Your CASE is awesome. Congratulations!! Ahhh! so so happy for you. And wow!! What a card...so stunning! Absolutely stunning card!! Huge congrats on your new and well deserved DT gig!! This is just so soft and pretty and huge congrats! Well deserved!!! So pretty, Karen! Congrats on joining C&9th! Looking forward to being inspired by your work! You are an amazing addition! This card is stunning- I find myself studying all the lovely details- will need to try this for sure! Yippee! So happy that you are part of the C&9th challenge team! What a well-deserved honor! This card is stunning, Karen! Whoop whoop! Congrats on joining the DT! So awesome and you're off to a stunning start. 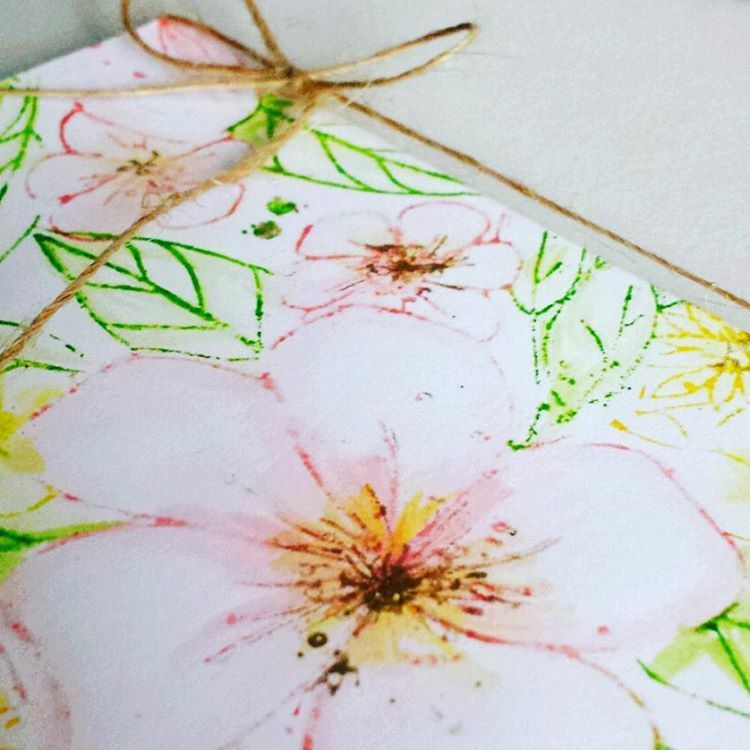 Love the gorgeous watercolor look of your card. Congrats on joining the DT. Love love love this card. I think I need to bring out this stamp and my Zigs to CASE this card. Congratulations, Karen! And what a beautiful start! Great color, and I love that little bit of hemp for texture!